The 2018 Evesham Carnival was the 90th edition of the event, organised by Evesham Round Table, and gathered in Crown Meadow for assembly and the judging by the Mayor of Evesham Mark Goodge assisted by Evesham Town Cryer John Raphael. The theme for this year’s floats was an open theme so there was a wide variety of floats (on the back of large lorries (supplied by local firms). Moana theme), Complete Spas, Heart of England Mencap, Tesco, Evesham and Badsey Hockey Club, Eilm Christian Centre, Evesham Polish Community, United Dance Academy (with their beach theme, Springfield Mind, Boogie Bounce, Working World (with their Charlie and the Chocolate Factory theme), Evesham Girl Guides, Evesham and District mental Health, Choice Day Opportunities, Evesham Hospital Club, Cidermill, Freedom Day centre and Lizzie’s busy Bus. For the first time the Evesham Ladies Circle (who organise the Carnival Queen) decided to expand this to have a Carnival King as well. 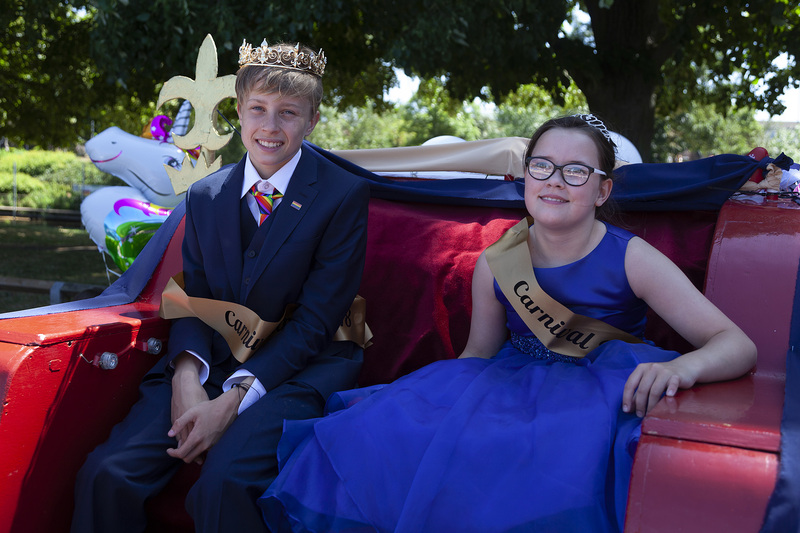 So Olivia Hancock (12) and Ciaren Baker (12) had been crowned for the event. They were supported by several attendants Coen Perkins (10), Tahlia Walker (7), Lucy-Grace Walker (8), Daisy Alford (7), Grace Hancock (7) and Caitlin Paul (7). The Carnival king and Queens float was made by the Evesham Ladies Circle chaired by Lucy Workman. The procession made is way around the town first going over the Abbey bridge, along the river and over the Workman bridge and all the way around the town, past the Town Hall. Large crowds were out in the sunshine to applaud the floats as they went past before they finished in the Crown Meadow by the river. trophy by Evesham Mayor Mark Goodge, and Evesham Carnival chair Adam Spiers. 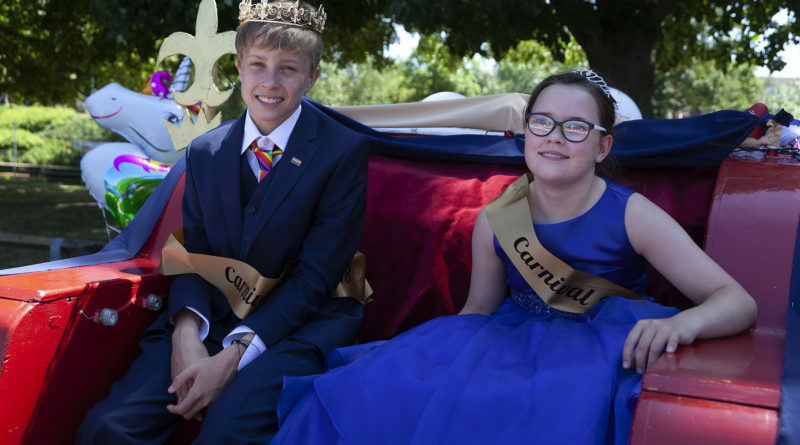 Then the carnival moved onto its musical part of the event with Brad Nash, Ciaren Baker (the Carnival King) and Teigan Koorts (a past Carnival Queen), Michael Knowles, Betsy Harmony and finishing with a set by Soul Manifesto. Around the stage were a variety of local stalls and food outlets with the ice cream vans doing a roaring trade on a hot day. Thanks go to Main Sponsors The Valley along with Tesco, Karndean Design Flooring, Wychavon District Council, Evesham Town Council and Mick Kilby Sound. The 91st Evesham Carnival will take place in June 2019.